English Education International Conference (EEIC) is a forum for scientific discussion on education, teaching, learning, languages, general linguistics, and general literature. In the Faculty of Teacher Training and Education, Syiah Kuala University, we highlight the excellence in education and research. In this era, we are encountering more challenges in these domains; therefore, as members of the academic community, our duty is to find innovative research solutions for them. Hence, the goals of this conference are to present, share, and discuss our knowledge and experiences with each other. This website consists of the published proceedings from the EEIC. 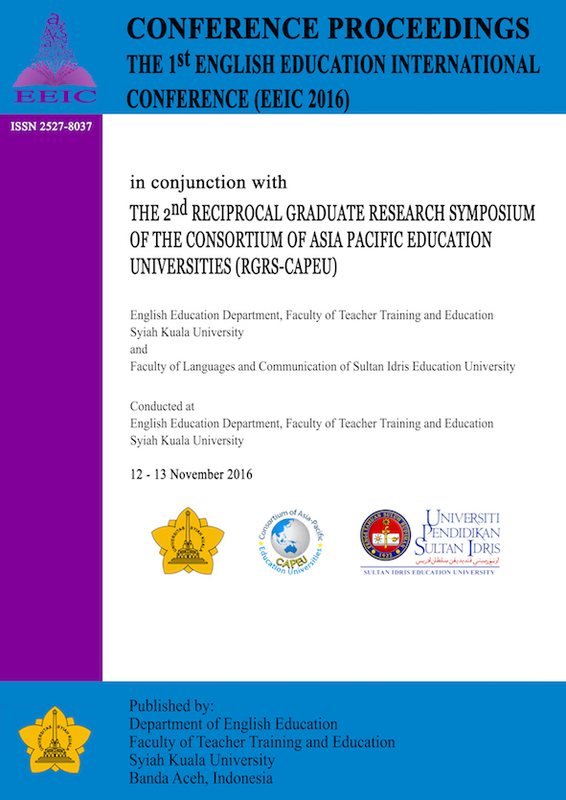 Volume 1 Number 1 consists of the proceedings of the 1st Reciprocal Graduate Research Symposium, a conference of CAPEU (Consortium of Asia-Pacific Education Universities) in partnership with the English Education Department, Faculty of Teacher Training and Education, Syiah Kuala University, which was held on 26-28 February 2016 in Universiti Pendidikan Sultan Idris, Perak, Malaysia. Volume 1 Number 2 consists of the proceedings of the 1st English Education International Conference (EEIC) in conjunction with the 2nd Reciprocal Graduate Research Symposium of the Consortium of Asia-Pacific Education Universities (CAPEU), which was held on November 12-13, 2016 in Syiah Kuala University, Banda Aceh, Indonesia. These proceedings list papers presented at the 1st English Education International Conference (EEIC) in conjunction with the 2nd Reciprocal Graduate Research Symposium (RGRS) in partnership with Consortium of Asia-Pacific Education Universities (CAPEU) conducted by the English Education Department, Faculty of Teacher Training and Education, Syiah Kuala University on November 12-13, 2016. Speaking English: Why are EFL learners anxious? Movies and language learning: What skills do they conquer? The papers published in this proceedings are indexed in Google Scholar.